People we meet often ask "How do I become a sign language interpreter?" There is no short answer. In fact, there are entire web sites and books dedicated to exploring the question and its answers. The important thing to know is that you can't become a professional interpreter quickly. It requires education, practice, skill, and more practice. The first, and the most obvious answer is to learn sign language, if you have not already done so. Start with your local community college. Take American Sign Language classes and attend social events where deaf people congregate. 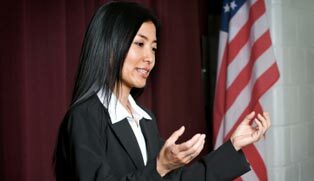 You will need to complete an interpreter training program (ITP). Although some people are able to become interpreters without completing an ITP, they are the exception and not the rule. In Southern California, there are numerous schools with ITPs. Here are a few them. Note that listing a college here does not imply an endorsement. Nor does a program's absence imply any kind of disapproval. We are just listing a few to help you with your search. Do a search of the web to find a school that fits you best. You will also need to earn your credentials. There are numerous advantages to being certified, one of which is you are eligible to work with WIN! Currently, the largest certification body is the Registry of Interpreters for the Deaf (RID) in Alexandria, Virginia. Their website provides guidance on the certification track and more detailed information on becoming an interpreter. WIN is a member of RID. Feel free to ask us if you need assistance. There are other interpreter education resources. You may wish to start by reading the book "So You Want to Be an Interpreter," available from numerous online bookstores.